The Roamer (1916-29), and its close cousins the Barley (1922-24) and the Pennant (1924-25), were manufactured by Barley Motor Car Co., first of Streator, Illinois and, later, Kalamazoo, Michigan. Marketed as "America's Smartest Car", the Roamer was known as the poor man's Rolls Royce. Over a period of fourteen years, roughly 12,000 cars were produced. Named for a distinguished race horse, its stylish lines turned heads; its power achieved numerous racing wins; and its advertising wooed the elite. These days, though, it's pretty rare to catch even a glimpse of one. Every car made was customized, with owners selecting the paint color, upholstery, and top they desired. As a 1919 ad intoned, owners expected their Roamer to be "dominant in performance, patrician in grace, exquisite in appointment, exclusive in every detail." Customization was stressed in a 1921 company publication in which an advertising writer asked one of the car's builders to picture his customers. The builder was said to have replied, "Well, I think of an English countess I saw once; of a dare-devil young college speed-maniac, and of an artist who uses beautiful combinations of lines and colors. I try to do my work so that all three of them would think, when they saw the car, that it had been built just for them." The Roamer's owners were legendary. From Oscar Wilde, an early owner whose quotations were featured in some Roamer brochures, to silent screen comic Buster Keaton and actress Mary Pickford (owner of a cream-colored Roamer with turquoise-colored interior features), the car was a symbol of wealth, leisure, and impeccable taste. Lesser-known Broadway and film stars were featured in Roamer advertising, too — Julia Sanderson, Raymond Hitchcock, William Farnum (a big sensation of the day), Wallace Reid (called "the screen's most perfect lover"), and many others. An ad appearing in The Theatre magazine of December, 1916, stressed the Roamer's appeal to theatrical artists: "Let Sarah Bernhardt enter a room and instantly her personality will dominate the gathering. The same holds true of the Roamer." 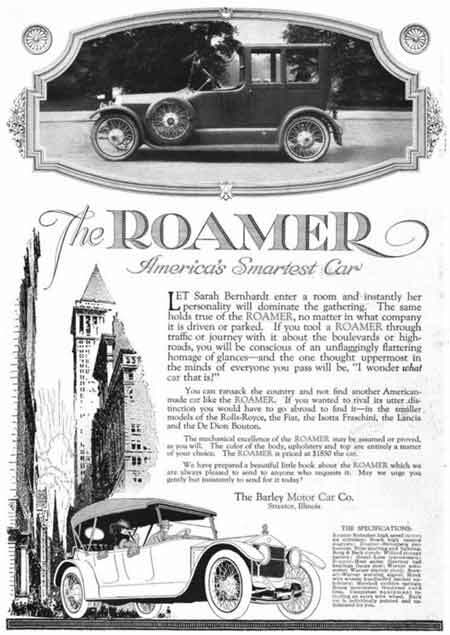 Then, too, the Roamer was one of the actual stars in a Broadway show when the producer of 1919's "A Regular Feller," a play about "motoring thrills and consequent romantic adventures", chose to use a Roamer when action called for a car. 1916 ad in The Theatre Magazine. Three men collaborated in producing the Roamer: A.C. Barley (manufacturer), Cloyd Y. Kenworthy (distributor), and Karl H. Martin (designer). Their unique talents blended to develop a sporty car that appealed to America's "aristocracy". 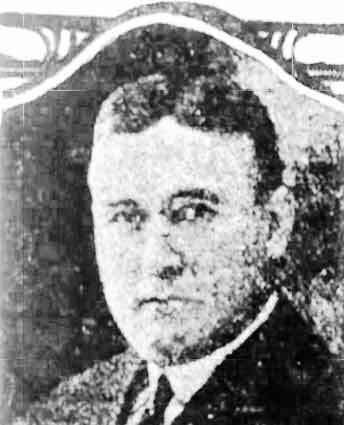 Albert Clayton Barley, for whom the company was named, was the son of James Lafayette Barley, wealthy sawmill owner and business investor (holding interests in a number of firms, including Rutenber Motor Works) of Marion, Indiana. His was the second family in town to have a car, a chauffeur-driven one. In later years, however, the family had many more models, most of those self-drive, and, in 1908, presidential candidate William Jennings Bryan drove one of the family cars during a campaign visit. Three years later, President William Howard Taft visited Marion, as well, and Secret Service agents used a Barley family car during that visit. In all likelihood, the family's three sons — Albert, Charles G., and Fred L. — were infected with their father's enthusiasm for automobiles as they assisted him in managing his business affairs. A sister Edith married J. W. Stephenson, a young man who began in the tin pie plate manufacturing business but who would go on to find employment with automotive concerns, as well. Born in 1877, A.C. was the second Barley son. But it was his older brother Charles G., born 1873, who was groomed as his father's alter ego in business affairs. For a number of years he worked in an elevator company, then founded Marion Ice and Cold Storage Co., served on the board of directors for a bank, department store, stove company, table company, loan company, electric company, etc. In 1911, he bought out the Harwood-Barley Truck co., one of America's five original truck production companies. That company, which his father had headed, was originally established to make iron and brass beds, bed springs and motor trucks. As George lavished more attention on the trucking concern, he also married the other partner's daughter, Mae Harwood. The firm eventually became known as Indiana Motor Truck Co. Their trucks were powered by Rutenber engines, a company Indiana Truck would later purchase. The elder son, however, died, unexpectedly, in 1922, following an operation for uremic poisoning. That left Albert, who had certainly not been overlooked when it came to business affairs. The elder Barley had involved him in running a business empire that stretched over numerous concerns located in several states. Born July 1, 1876, Albert attended school in Marion, and, by 1901, was managing his father's dry-goods (department) store, the Miller and Barley-owned Big Store. That year he went to Chicago to confer with an attorney and represent the family's interests in a successful attempt to secure a temporary injunction against the Royal Manufacturing Co. of Chicago, forcing them to return customer photos they held. Royal had contracted with Miller & Barley to have a concession in their store offering to enlarge a photograph for free, if the customer bought at least $25 in merchandise. Royal had hoped to interest customers in purchasing one of their picture frames for displaying the enlargement but sales were hard to come by. Barley disliked Royal's sales methods, however, and cancelled the contract. Royal sued for breach of contract and refused to return the customer photos — until the court made them do so. Barley had proved he was unafraid to face down a business opponent. He took his job seriously, running the store as a co-op with customers participating in profits, and spending significant sums on advertising. A store ad appearing in February 1910, for instance, called to customers: "Money! Why you'll be surprised how little it takes now, yes, fairly amazed at the extent of its purchasing power at 'The Big Store'. By 1906, he was doing well enough to open a branch store in Indianapolis. In 1908, he was in Chicago, paying $160,000 for a 7-story building with space for a store and apartments. In 1911, though, when the Big Store, the town's largest department store, merged with the Boston Store, the other store in town, Albert left to devote time and attention to his other large business interests in Marion, Chicago, and Kansas City. Those interests led him to invest more heavily in the automotive industry. From 1903 to 1905 he sold cars. 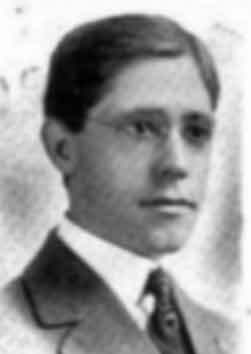 In 1909, he was a Board member for Western Motor Co., forerunner to Rutenber. By about 1910, he was a large shareholder and Board member for Rutenber Motors, although he sold his interests in the company in 1912. In 1913, he purchased his first car company, the Streator Motor Car Co. of Streator, Illinois. Streator was the successor to Erie Motor Carriage Co. and, since 1905, had been in the business of making Halladay automobiles, powered by Rutenber engines. The company had been put into receivership in 1911, and Barley bought the company's assets two years later, planning to continue production of the Halladay, focusing especially on the Model O, a seven-passenger touring car. The new company was Barley Manufacturing Co., and Halladay production would continue for a few years until Barley's attentions were directed elsewhere and he sold Halladay to a group of investors who moved the business to Ohio in 1917. The Streator purchase was followed by another the following year, when Barley bought Wahl Motor Co. of Detroit, planning to continue manufacturing the Wahl in Streator, alongside the Halladay. The Wahl was a mid-sized car that could be sold to dealers interested in affixing their own nameplates to the cars they bought. Barley's interest in the Wahl, however, was very short-lived. Still, his interest in motor cars continued. In February 1914, he bought Nyberg Automobile Works of Anderson, Indiana, planning to continue manufacturing Nybergs after paying $7500 cash and assuming liens of $22,000. There, too, however, the Nyberg did not capture his attention for long. Not long after investing in the Halladay, the Wahl, and the Nyberg, A.C. became enthusiastic for the Roamer, a car with a European flair. 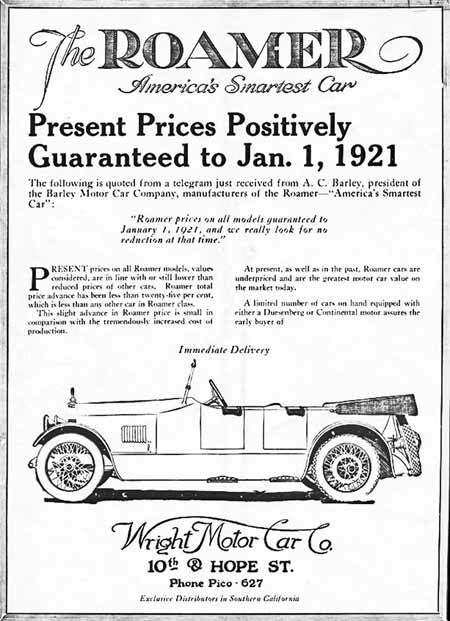 A Barley advertisement explained to would-be buyers that the Roamer was "built to satisfy an ideal, not to meet a price and while it has the mechanical genuineness of automobiles selling well above its price, its appearance is like no other car built in this country today." Barley sold his interests in the Roamer in 1924 but by 1927 was back again as the company's president. That year he also took over the Rutenber plant in Peru, Indiana, to manufacture engines for trucks. In 1929, he locked the doors and closed the Roamer production plant in Kalamazoo, Michigan. Not much is heard from him thereafter. We do know, however, that he was a man of average height, a little stout, with brown hair and hazel eyes. In 1903, he married Mary Alice "Mayme" Broderick. From that union came two children — Ann Louise in 1904 and A.C., Jr. in 1910. After a successful career in business, A.C., Sr. died in Detroit on October 13, 1951. The second in the Roamer triumvirate was Cloyd Young (C.Y.) Kenworthy. C. Y. was born in Illinois in 1878, lived in Bellerose, Long Island, and was the Eastern District Manager for Cleveland-built Baker-Rauch & Lang Electrics, headquartered in New York City. At least as early as 1911, he was the manager of the Rauch & Lang New York concern and took an active role in organizing the New York Electric Vehicle Association. He was a tall man with dark brown hair and blue eyes, a dapper dresser, and well-known in the electric car circle. In 1911, he arranged for a run of electric pleasure cars in New York and wrote an article for The Brooklyn Daily Eagle (May 14) entitled "Comfort Now Considered", a short piece used to impart the wisdom that a woman's "delicate nature does not take kindly to being bumped over rough roads at a speed of an express train"; her comfort was to be valued over speed. Kenworthy was searching for a mid-priced, attractive, gasoline-powered car to add to his electric cars which were waning in popularity by 1915. The Roamer filled that need, and besides being Roamer's vice president, Kenworthy (who, following his father's death in 1914, had moved to Chicago to be nearer his widowed mother) held the Chicago market for the car. Just a few years after launching the Roamer, however, Kenworthy departed the firm — in November 1919 — to build his own luxury Kenworthy car. Roamer's designer Karl Martin designed that car, as well, and advertisements pronounced it a quality product resembling an English Rolls-Royce. Its peaked radiator design, like the Roamer's, was a knock-off of the Rolls but, unlike the Rolls, both the Roamer and the Kenworthy were assembled cars. In a leased plant in Mishawaka, Indiana, more than two hundred Kenworthy autos were produced from 1920-21. Besides a Big Four and a Six, Kenworthy was available in a handsome "Line-o-eight", the first production car with an eight-cylinder chassis and four-wheel brakes. The Kenworthy, while impressive, was also expensive, in the range of $5500, and with the national post-War recession, there just weren't enough customers. Despite his best efforts, Kenworthy was forced to declare bankruptcy by August, 1921. Let's return, though, and take a look at how designer Karl Martin first got involved with the Roamer. Once Kenworthy made Barley's acquaintance and learned that he was interested in producing a new line of Halladay automobile, he thought immediately of a young talent he knew. 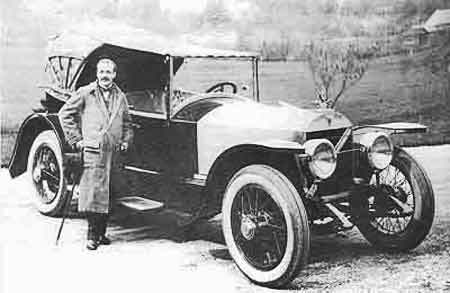 Karl Hamlen Martin, an automotive designer and custom car builder Kenworthy had met in 1915, was one of a handful working in New York at that time. While Martin's designs with graceful, flowing lines were not appropriate for the boxy Rauch and Lang car, Kenworthy thought they might be just the thing for a new, classy car — like the Roamer. Martin, born in 1888, hailed from Buffalo and learned to drive on his dad's Columbia electric at age nine. By age twenty, he had settled in Ohio and become involved in several oil production companies. Four years later, however, he decided he'd had enough of that and relocated to Manhattan where his father had recently retired. With his father's blessing and financial support, Karl set his cap on auto design, quickly noticing that European companies were ahead of American builders when it came to design, strength, and precision. So, he concentrated his efforts on designing for European chassis. Once a client selected the chassis, Martin and the client would decide on a body style and go over client requirements. The next step was for Martin to produce a detailed sketch and watercolor rendering. Once approved, those were turned over to draftsmen to complete full construction drawings that could be sent to various body builders. At any rate, Kenworthy introduced Martin to Barley. Barley was sufficiently impressed to offer the designer the then-princely salary of $50 a day, an amount sufficient to get Martin on a train to Chicago where styling work on the Roamer could begin in earnest. After devoting his attentions to the new car for months, in 1916 Martin had the Roamer ready to meet its public. Barley was exceptionally pleased with the final design, one that closely resembled that of a Rolls-Royce Silver Ghost touring car, though in a smaller version. During WWI, Martin served in the U.S. Navy where he taught mechanical drawing at the Great Lakes Naval Training Center in Chicago and, later, at Curtiss Aviation Corp. on Long Island. At war's end, he returned to Chicago where he again took up automotive design. One of his projects was designing the radiator shell and bodywork for the Deering-Magnetic automobile. By 1919, however, he'd moved to Bennington, Vermont, home place for his maternal grandparents. The automotive trade hadn't yet reached the Vermont woods, so Martin ended up distributing St. Christopher (fittingly, the patron saint of drivers) medals and selling hard woods to car body builders and manufacturers. It was also in 1919 that Kenworthy prepared to launch his car, which Martin designed. By then, Martin had caught the car bug and took a notion to design his own — in Vermont, where labor was plentiful and costs were low. By June, in association with two of the town's attorneys, the Martin-Wasp Corporation was formed. Martin gathered a crew quickly and a 4-cylinder Wasp prototype was readied. Because he had missed the show deadline, the Wasp could not be shown at the Grand Central Palace for the 1920 New York Automobile Show but appeared instead in leased lobby space at the Hotel Commodore. That first assembled car appealed to actor Douglas Fairbanks who bought it and had it shipped to California. That sale may have over-inflated Martin's sense that his over-the-top design spoke for itself. The Kimes-Clark Catalogue of American Cars described the Wasp: "The word flamboyance found all-new meaning in the Wasp, with its sharply pointed, stylized fenders, its fully-nickeled German radiator, its large step-plates, the natural wood bows on its top of many curves, the bullet lights in the windshield, the sheen of its black lacquer body contrasting with the high polish of its natural aluminum hood." Inside, its dashboard even featured a Martin-designed St. Christopher's medal. With all that going for the car, Martin decided there was no need to advertise. It was months after the Wasp's introduction, for instance, that photos of the car first appeared. Nonetheless, the first six cars sold to well-to-do customers, and another six cars were produced. By 1922, the company needed more space and, late that year, came out with a six-cylinder model. While the Fours at $5000-$6000 were not proving profitable, the company hoped the Six at $10,000 would be. Still with no advertising, sales were practically non-existent and investment money dried up quickly. Fewer than fifteen Wasps were ever built. A number of interests joined in creating the Roamer. Barley wanted to build a "special", mid-sized car. Kenworthy wanted to market a distinctive gasoline-powered car. Martin wanted to design a car that would appeal to a middle-class buyer. And the Everts-Adams Co., New York distributor for the Italian-made Lancia, wanted to market an American car with European panache. Once Kenworthy heard of their interest in 1915, he contacted Barley, put him together with Martin, and, voila, the new "Halladay Special" (later to be known as the Roamer) was created. There are several tales as to how the car got its name but there's no doubt that its progenitor was Roamer, a famed thoroughbred racehorse, 1914's leading earner and horse of the year. One story has it that Kenworthy's chauffeur suggested the name, not unusual in a day when chauffeurs were part and parcel of the automotive design process. Another account has to do with lunch at New York's Savoy Hotel where Andrew Miller, who owned the famed racehorse, was boasting about his champion. The Barley principals were there, as well, and thought they'd like to name their new product after a proven winner. So, with scant capitalization (only $50,000), the Barley Motor Car Co. was incorporated in New York in September 1916 for the purpose of building motor trucks, cars, autos and accessories. 1916 ad for America's Rolls-Royce. While a few sample cars had been produced and sent to Paris and London for inspection as early as 1915, the first Streator-produced Roamer model, announced in 1916, was the Roamer Six, an elegant four-door convertible sedan tourer with a six-cylinder 24 horsepower engine that sold for $1,850. The Roamer line later added a $2,150 roadster and a $2,650 hardtop town car. All three models featured the latest equipment such as wire wheels and electric clocks — and would be painted and upholstered at the factory any color the customer chose. Early Roamers were equipped with Rutenber six-cylinder engines or, alternatively, a more powerful and more expensive line of four-cylinder Rochester-Duesenberg engines. They also all featured a distinctive grill modeled after the one on Rolls Royce automobiles. The grill was made of German silver, a metal alloy with no silver, but customers likely presumed them to be "real silver", just what they'd expect to find in the classy Roamer. 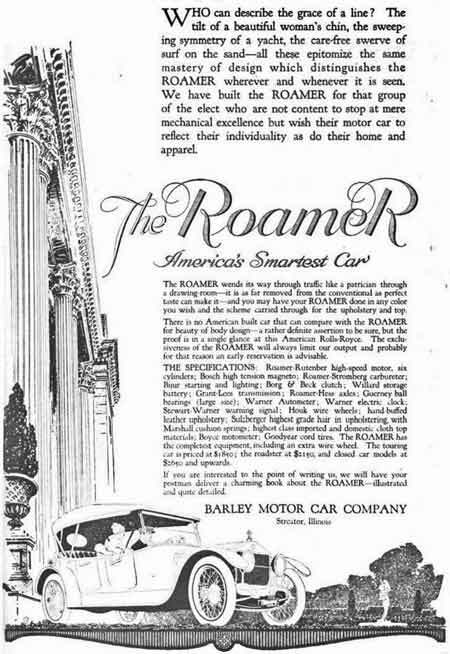 The company's ads featured the Roamer in cosmopolitan settings and the vehicle was promoted as "America's smartest car" — smart in the sense of being stylish. This was an assembled car with a style resembling a boat body, i.e., wide in the middle and tapering toward the cowl and rear. It had sporty, long, low lines; a slanted, vee'd windshield; dome fenders joined by a running board; and wide, comfortable divided front seats. Its primary style feature, though, was that flashy nickel-plated grill which made customers think of Rolls Royce. A 1916 ad reminded customers they'd have to turn to European makes, like Rolls-Royce, Fiat, Isotta Fraschini, Lancia or De Dion Bouton to find distinctive style like the Roamer's. The resemblance to the Rolls, in fact, may have been a little too close. In time, Rolls-Royce, displeased with the similarity, successfully sued and was granted a 40-cent per car royalty. 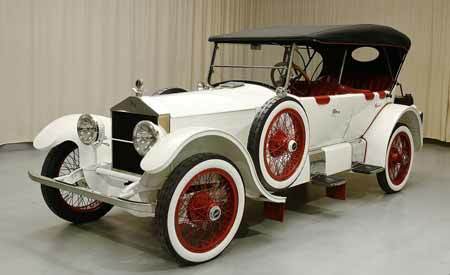 On January 7, 1917, the Roamer was shown at the New York Auto Show. An ad at that time explained its importance: "Just as there are companies which build many more pianos than Steinway, so there are motor car manufacturers whose output dwarfs that of the ROAMER. The ROAMER will never be a motor car of that class of hastily produced, hurriedly finished cars which rapidly become the 'great unwashed' of motordom." So, there. One of the Roamers featured at the New York show was a six-passenger open touring car with a six-cylinder Herschell-Spillman engine. In keeping with what was expected in the luxury market, there were vertical compartments at the side of each rear seat, one for a lunch set and Thermos bottle, the other for a smoking set. Even as the car attracted admirers, though, the company faced manufacturing problems. In 1917, there was a labor strike at the Streator factory. In reaction, Barley simply relocated manufacturing to the former Kalamazoo Buggy Company factory in Kalamazoo, Michigan. The move was made easier by a grant of $5000 from Kalamazoo's Chamber of Commerce. Once there, Barley began ordering sedan bodies for new Roamers from Limousine Top Company, an ancillary company of Kalamazoo Buggy. Sales of the car were strong, burgeoned by ads comparing them to distinctive styling in chairs (Sheraton or Chippendale), or designer gowns (Paquin or Premet, leading French designers) and claiming this was "the most talked-of car in America". 1250 cars were sold that year, some of those to the export market. For the New Zealand market, an ad showed a woman driving and claimed that building beautiful cars was becoming a neglected art — until the Roamer, that is: "Not everyone will want to own a Roamer, it is true, but there are a number who will find it the motorist's realization of their ideal". In Melbourne, Australia, Prime Minister Hughes found himself having to defend his office's purchase of a Roamer. As he would explain, there were no English cars available at the dealership just then (The Argus of 2 March 1917). Eventually, there would be Roamer sales representatives in Australia, China, Japan, India, Hawaii, Java, and Siam. And James Vusher of Athens, Greece, was on record for ordering Roamers to attract customers who'd otherwise go to Rolls. He surely was not alone in having done so. By 1919, about half of Roamer's production was destined for the overseas trade. The company was cost-conscious even as its market grew, however, increasing the sales price by $40 when the cost of materials rose in the summer of 1917. Trying to turn even the increase to their advantage, however, they urged customers to buy right away, since: "It is quite possible that we will be compelled to make a further raise in price within a short time, because our manufacturing standards will not permit a decrease in ROAMER quality." 1918 brought Model C6, replacing the earlier Six. Powered by a larger, more powerful engine — the Continental Red Seal Straight Six which produced 54-hp, it was available in eight body styles, selling from $2200 to $4900. That year also marked the introduction of a new motor option, the powerful Duesenberg engine. One ad depicted a woman descending the stairs of a mansion, with a sketch of the Roamer's radiator front at the side, noting, "The Duesenberg 'miracle motor' now adds time and distance mastery to Roamer design distinction. Seventy-five miles an hour on the straightaway — fifty miles an hour over hills is guaranteed." The Duesenberg engine would figure significantly in a number of Roamer racing wins . With the nation at war, however, another 1918 ad explained that production of the Duesenberg engine that year would be limited. During the war years, automotive production generally was down because of a lack of metals. In January, 1918, the Roamer was shown both in New York — where two Sixes (the C-6-54 and the D-6-90) and one 4-cylinder (D-4-75) were on display — and in Chicago (with custom coachwork by Karl Martin), alongside the Rolls-Royce, Locomobile, White, and others. The cars on display were composite cars, with a Bosch ignition, Bijur starting and lighting, Stromberg carburetor, etc. They had three-speed manual transmissions and drum brakes. 1918 Roamer C-6-54 Touring car. Photo courtesy of Hyman Ltd.
Coachwork was becoming more important, as well, with some custom-designed coaches from outside builders but also with Roamer adding a custom body department to its factory. The following year, famed builder Leon Rubay would begin designing closed Roamer bodies for in-house production. For 1919, there were twelve body types available, still with the choice of Continental or Duesenberg engine. There was also the introduction of a ladder design chassis with three cross members and a 6-inch deep, stamped steel channel section making up the side rails. Cars were being produced at the rate of about four a day at the start of the year, with plans to increase that by 200% in a matter of months. Annual production for 1919 was about 1100 cars. M.A. Williams, the Washington, D. C. Roamer dealer interviewed for a March 2 article appearing in The Washington Herald, explained the market opportunity for the Roamers. Because European countries had been impoverished by WWI, European car production was limited and European buyers were looking to the American market instead. American cars, especially those like the Roamer that were based on European chassis and body design, stood the best chance of competing successfully. The New York Tribune of January 9, 1920, reported that the Barley Motor Car Company was being reorganized. Since most of its shareholders were resident in Kalamazoo, it was to be incorporated under the laws of Michigan (rather than its original New York incorporation). The Kalamazoo Industrial Realty Co. was formed as a holding company to take over the Barley site and factory. Barley claimed its 1919 output to have been about 1500 units (rather than the 1100 now thought to have been produced), with plans to make 4000-5000 cars in 1920 (actually pegged at 1630). The company also had on hand export orders for 700 cars. To produce such large numbers they employed 325 factory workers, adding another 125 workers during their rush season. Customers had numerous choices to make. They could opt for a Continental or Duesenberg engine; open or closed car; and coachwork by Rubay (sedan, limousine, landaulet and town car) or Roamer (cabriolet, coupe and suburban). Women were taking to the roads more and more, and some of them were driving Roamers. The San Francisco Chronicle of April 11, 1920, noted that Mrs. A. L. Ellis would drive across the country in her Roamer. She'd stowed away a collapsible electric stove and cooking utensils in the car and planned to camp along the way, setting up all she needed each night in about half an hour. In August, for the first time a Roamer was shown at the National Motor Show in Canada. Things were definitely looking up for the company but by October, it was feeling the pinch of other companies reducing their prices significantly. An ad in the October 18 edition of the Chicago Daily Tribune explained that need: Other companies said they were lowering prices but were, in reality, just admitting to having inflated prices following WWI when their material and labor prices rose 20-65%. Roamer, during that same time, had "honestly priced" its cars, raising prices only 15%. The company knew, though, that for loyal Roamer customers, quality mattered more than price. As the ad recounted, their "continued desire to possess a ROAMER expresse[d] splendidly the caliber of those who purchase America's smartest Car, a group to whom spectacular announcements of lowered prices hold no interest." The following year, the company was less sanguine as to its customer's high-mindedness. By June, they announced a price reduction between $410 and $805 per car, made possible because parts makers had reduced material prices and dealers had reduced sales commissions. In point of fact, those dealers had been squeezed to accept a 25% reduction in commissions for six months. The company hastened to assure customers, however, that the Roamer's high quality would not be impacted by lower costs. Mechanical upgrades went along with the lower prices, as well. First, there was a new engine for Roamer sports models — the Rochester-Duesenberg, which Rochester Motors Corp. began producing in 1920. 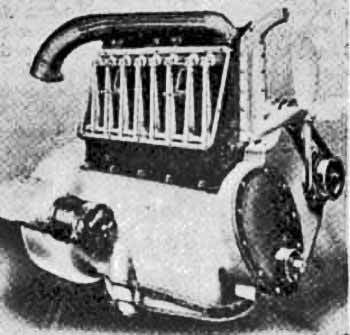 It was a 4-cylinder, 75 hp motor with horizontal valve action. Although the earliest engines lacked sufficient power, a later redesign increased the size slightly, and with the larger size came greater power and diminished engine noise. 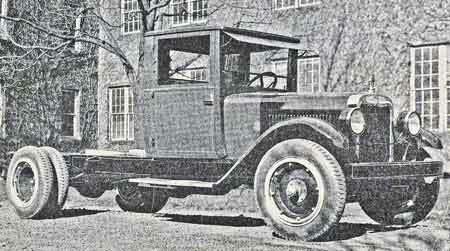 Another change for 1921 models was the adoption of double cantilever suspension. In that system, one spring is located above another, with each of those springs attached to the rear axle. The doubled springs meant that each spring could be lighter and longer and that the ride was smoother. For the ignition system, the Roamer utilized a combination of high-tension magneto and a storage battery. Other makers relied on one or the other. The company put a premium on inspecting the mechanics of the car before it reached the sales floor. In a booklet titled "The Double OK", the company explained that a finished car was given to a team of testers. They stripped the chassis, installed a temporary seat, loaded the car with heavy concrete blocks, and took it out for a spin. They kept tweaking the car until they were satisfied it was good to go. It was now established practice that customers had numerous customizing options. There were fourteen colors of leather upholstery and eight kids of top material. And, at no additional cost, the car could be painted and striped to meet the customer's choice. In 1922, company advertising capitalized on the quality of new features, claiming its Continental engines (both the Red Seal and the 12-XD) were "a marvel of power, quietness and snappy pick up", producing an impressive 15 mpg. For closed models, at no extra cost, Perfection heaters were supplied. And for all models, the company stressed that the car was not only a pleasure car but also, due to high resale values, a true investment. The biggest news for 1922, though, was the introduction of a new, lower-priced Light Six, one named the Barley. 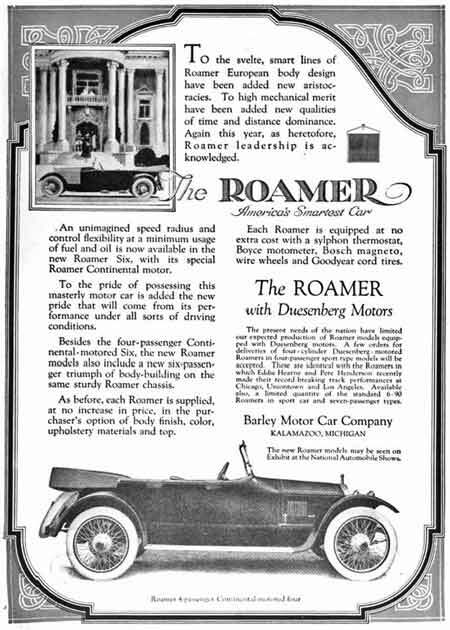 1923 was a boom year for the Roamer. There was another reorganization, this one merging Barley interests with those of the Kalamazoo Realty Co., creating the Roamer Motor Car Co., capitalized at $2.5 million. Production peaked, with nearly 2000 cars produced (including numbers for the Barley). As one ad crowed, "The Roamer Pleases Everyone — the eye of the artist, motor judgment of the engineer, sense of comfort of the owner." Besides adding a sports sedan and touring sedan to the 1923 Roamer line, at mid-year the company entered the taxicab business, as well. The Roamer Company was interested in new opportunities — first, the lower-priced Barley, then the Pennant taxicab — but sales were not easy to come by. In January, 1924, A. C. Barley sold his interest in the Roamer Company and the Kalamazoo factory, even while remaining on the firm's Board of Directors. The firm's new president would be George Peter Wiggington, working with a new Board of Directors and promising to resume production in February (Note: there must have been a factory closure at the start of the year). Wiggington was born in Steubenville, Ohio, but at age four, moved with his family to Pittsburgh, Pennsylvania where he completed high school. His first job was with a printing company washing rollers for $4 a week, and from there he moved to bookkeeping at a laundry. The job he stayed at for thirteen years, however, was with a bookbinding company where he moved up to plant superintendent, later becoming Secretary and General Manager. When his wife experienced poor health, though, he and his family moved away from the big city, coming to Kalamazoo where he was associated with the Kalamazoo Loose Leaf Binder Co. He began as general manager in 1907 and, over time, became president of the firm that did nearly $2 million in business annually and employed more than two hundred employees. In 1922, he was also listed as vice president of the American Sign Co. of Kalamazoo, a concern manufacturing electric signs. He was a slight, wiry, energetic man and, like so many businessmen of his day, he also was an inventor. He held patents on a loose-leaf binder, a card filing device, and a solenoid voltmeter that electricians could use to test electrical power circuits. About mid-year, a group of Canadian businessmen bought the company, renaming it the Roamer Motor Car Co., Ltd., and moving incorporation and operations to Toronto, Ontario. The Barley and the Pennant, however, were still to be manufactured in Kalamazoo. While Wiggington was a proven manager, Barley's departure from the firm left it searching for ways to regain its footing. Roamer abandoned the Continental Six engines, replacing them with a Lycoming 8, priced the same. The Roamer 8-88 came in seven body styles — but sales were still sluggish. Another blow came when Roamer was unable to continue with Duesenberg engines. In 1926, Deusenberg experienced slow sales and lacked the wherewithal to continue producing engines for Roamer. Despite the Roamer's poor sales performance, the firm expanded in 1926, opening an assembly plant in Los Angeles., California. The Canadian interests did not last long. By 1927, Roamer was back in Kalamazoo with Barley as president. The March 13th edition of the Brooklyn Daily Eagle reports him saying that the company's focus was then on straight 8s. There were three Eight models, delineated by the horsepower each produced and ranging in price from $1985 to $3485. The 8-78, its newest model with the shortest wheelbase (124"), was available as a 2-passenger roadster, a 2-passenger coupe, and a 5-passenger brougham. The 8-80, with a 128" wheelbase, came as a 2-passenger coupe, 2-passenger roadster, 5-passenger sedan, or two-door, 5-passenger sedan. And by far the longest, most powerful 8 was the 8-88 with its 136" wheelbase, available as a 3-passenger sedan, 2-passenger roadster, or 5-passenger tourer. The 8s were still assembled cars with Barston or Jones transmission, Borg and Beck or Raybest clutch, and a Steward speedometer. By this late date, 26% of Roamer's output was for the export market. In Shanghai alone, 41 of a thousand cars were Roamers. Despite the sales slowdown, Roamer debuted a new Six, 3/4 ton heavy duty truck at the 1927 New York Auto Show, said to be a great value. The following year, two-thirds of the Roamer production was in trucks — including a Model B 6-cylinder with 4000-pound capacity, a one-ton, two-ton, and four-ton six-cylinder, all with an armored front, cast iron radiator, and distinctive Roamer grill. Even as the company turned out its 8s, though, and tried to market its new truck, it was selling off its older models, engines, parts and equipment. Despite all financial evidence to the contrary, investors continued to believe in Roamer's value. The April 27, 1928 edition of The News-Palladium (Benton Harbor, Michigan) reported that the Roamer Consolidated Corp. of Kalamazoo had been organized as a Delaware corporation and had been formed to take over the business of the Roamer motor car and several allied concerns. Sales for the Roamers never recovered after 1924, and from 1927 onward only a handful of cars and trucks were produced each year. By 1929, even before the Wall Street crash, the Roamer was done for. Over the course of its history it had produced about twelve thousand cars.